Amazon Price: CDN$ 44.99 (as of February 8, 2019 5:45 am - Details). Product prices and availability are accurate as of the date/time indicated and are subject to change. Any price and availability information displayed on the Amazon site at the time of purchase will apply to the purchase of this product. Bath time has never been so much fun. Be the captain of your own boat. Catch a fish. Comb your hair. Clean your nails. Scoop up the water and pour it out. Do it all with the B. Fish & Splish set. The bathtub is your ocean. Anchors aweigh! 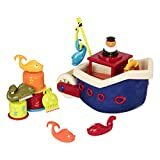 Includes floating boat with Captain, life preserver, fishing hook and 4 ready-to-catch fish, 3 nesting cups for showering, stacking, pouring, octopus comb and a whale nailbrush. Make bath time an ocean adventure. Ages 6 months and up.